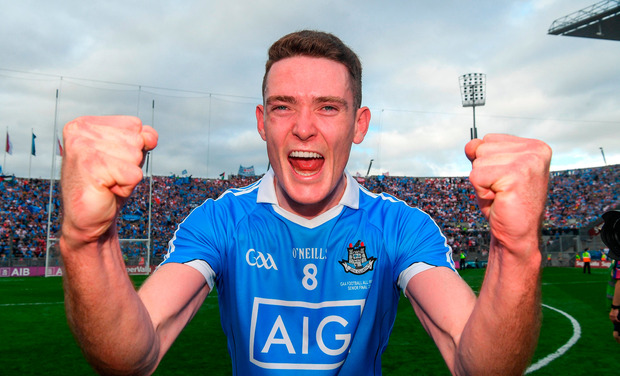 UNLIKE Alexander the Great, who wept when he saw the breadth of his domain and realised he had no worlds left to conquer, Brian Fenton looks like he intends to knock good craic out of trying to do it all again. "I was standing here a couple of years ago in the same spot saying 'two in a row is unreal'," Fenton recalled with a shade of disbelief as he made his way from the Dublin dressing-room to the party. "To think we did four in row is absolutely off the wall." To think that Fenton, who made his debut in 2015, hasn't even lost a match is completely bonkers. Dublin's run of unbeaten Championship matches stretched to 28 yesterday in Croke Park. If the sensation of winning is dimming in any way, the affable Raheny midfielder isn't showing it. "The couple of minutes there on the pitch after the game, there's just nothing like it. It's what you've been working on the whole year," he said. "To share those seconds with the lads. To share it with my Dad, my family, my girlfriend. All of them. "The emotion is just incredible. How am I feeling? I'm feeling on top of the world. That's a cliché but it's absolutely unbelievable." "All the previous years," he went on, "have been different games. Kerry, Mayo – everything has a different feel after the game. That was just so satisfying. "They came late at us. You don't get sick of it, certainly not. And hopefully we'll drive on again next year." At 25, all Fenton has left to achieve in this game is winning Footballer of the Year, although his main rival for this year's award, did his claims not harm yesterday. "Absolutely shattered," was how Kikenny described his physical and emotional state afterwards. "Being in the dressing room there is special. When you can look each other in they eyes, everyone who is involved in the team, their kids, whoever. "It's just a unique, special feeling. And when you're in that room together, it's just incredible." For a while, it looked like the whole day would shuffle towards its inevitable conclusion until that penalty Peter Harte rifled past Stephen Cluxton, to offer a glimmer of hope where none had been. "The main thing with the guys is that we kept calm," Kilkenny insisted. "We looked around at each other, kept together and drove it on to finish really well into half-time. "In those games, you're just in the heat of the battle and you have to respond. "Even when they went four points up, our guys went really hard after the kick-outs and won them and turned it around, that was really the difference in the game." Jim Gavin meanwhile, excused himself for being late when he arrived in for interview. His future is filled with references to five-in-a-row that he will try his best to ignore, avoid or talk around although that was for another day. "We don't cross any bridges. We're just on a journey," he pointed out. "There are lots of twists and turns in it, lots of bends. The next step I'll take is enjoying a night with my family, my friends, our great supporters. "Our competitors will have looked on. They will be planning. "There are a lot of changes in backroom teams in other counties so other teams will be gearing for their campaign. We're finishing our campaign. We won't even step into that space – it's about living in the moment." For Philly McMahon, the day was loaded with emotion. He lost his father Phil to cancer in July and for that reason, viewed yesterday's victory through a different lens to his other five All-Ireland wins. "Do you know what? The big thing for me this year is gratitude," he stressed. "I've said that loads of times. The realisation that there's people in that stadium, people at home watching that game that will never get to see another All-Ireland final again. "So we'll never get tired of that stuff. "We'll never get tired and going out playing in Croke Park. "We'll never get tired putting on a Dublin jersey and we'll definitely never get tired of winning All-Irelands." "The big thing for me is not actually winning four-in-a-row. It's putting happiness on people's faces. "My family ... I didn't care too much about winning today. I just wanted to see them smile," McMahon added, having sported a t-shirt with a tribute to his father on the pitch afterwards. "And in previous years, it would have been the opposite. "But more importantly for me now is I understand how we can help people's lives. For me personally, it's got better. It really has."